65% Polyester and 35% Cotton. Hand-Made in the Philippines. Mahalo for looking! Hibiscus / Tropical Floral Orchid. 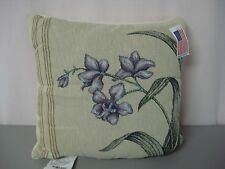 A Tapestry Throw Pillow. Filling Content Polyester Fiber. Cover 39% Cotton 38% Polyester 23% Polypropylene. Backing 51% Cotton 49% Polyester. Spot Clean. Crafted In The USA. Fringe color may vary, but will coordinate with the colors in pattern. BETTER PICTURES COMING SOON! 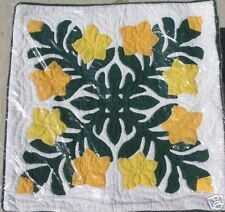 LIKE A CORDED PILLOW, AN ACCENT TABLECLOTH, A SHOWER CURTAIN, CAFE' CURTAINS, DRAPES, AND VALANCES. Cotton /cotton blend linen like. A quick way to liven up any room. Ok to ask for sample. color is Brown tones/green/burgandy/white. Color is Blue tones/green/pink burgandy. ok to ask for sample. Cotton /cotton blend linen like. A quick way to liven up any room. PRINT WILL VERY DUE TO DESIGN IN FABRIC. 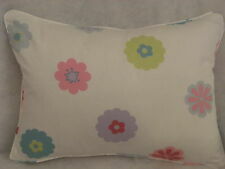 HERE FOR SALE IS A BEAUTIFUL OBLONG CUSHION COMPLETE WITH INNER/FILLER. 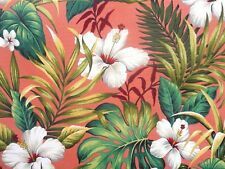 MADE FROM THE POPULAR "TROPICAL GARDEN" DESIGN BY JOHN LEWIS. THE INNERS ARE WELL FILLED VIRGIN FIBRE AND CONFORM TO STRINGENT BRITISH STANDARDS.